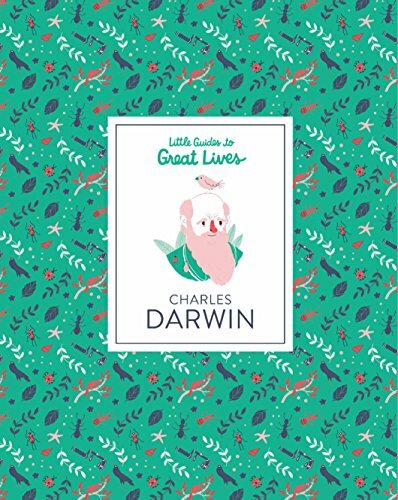 This tiny book is packed with fun facts about Charles Darwin, one of the most famous scientists of all times. After a summary introduction the author tells of Charles’ childhood years, the death of his mother, his early experiments, and his years at boarding school. Charles loved the outdoors, but his dad signed him up for medical school. That didn’t work out, so then Charles studied to be a minister. Interesting anecdotal stories are folded into the text and the art. Charles loved collecting beetles, and one day found three that he wanted to keep. He ran out of hands so put one of them in his mouth where it squirted acid down his throat. The letter that changed Darwin’s life invited him to join Captain FitzRoy on a voyage to survey South America as a naturalist. Charles was 22 years old when the boat left. He was gone for five years. The highlight of the trip was visiting the Galapagos Islands. FitzRoy almost said no when he met Charles because he didn’t like the shape of his nose. Charles was seasick much of the voyage, but he kept a daily journal and collected thousands of specimens of plants and animals. While searching for the Rhea bird, he realized he had been tucking into just such a bird at dinnertime. This is where the reader realizes the book, like Charles, is from the UK. The story becomes more generic when it gets to his adult life. But interesting tidbits keep it lively, such as his list of pros and cons regarding marriage. Charles married his cousin in 1839. The book tells of all Charles’ published works, title by title. Pages 44 and 45 give a clear explanation of Darwin’s theory of evolution through natural selection. At first Charles didn’t want to publish his thoughts until another naturalist sent him a letter with a similar theory. Charles knew he had to publish a book soon to save all of his hard work. His book was a big success in England. He called it On the Origin of the Species. Some people didn’t like Darwin’s idea that humans were descended from other animals, like apes. There was a meeting to discuss it with 1000 people in attendance. Both sides claimed to have won. Ten years later Darwin was world famous and continued to write other books about orchids and earthworms. Then he wrote The Descent of Man. The book by Dan Green tells of things named after Darwin, how his ideas have shaped science and has led to the study of genetics. There is a two-page timeline, a glossary, and a one-page index. The sole photograph of Darwin is at the end as an adult. The art is done in red, green, pink, and black in a cartoonish, pleasing style. There are lots of sidebars, speech bubbles, letters, and maps to keep it interesting. Aside from the spare color combination, the book works. It’s informative, interesting, and easy to understand. Two of the best points the author made is that Darwin was not an overnight success. It took him decades to develop his theory. Also, the author points out that many others before Darwin had come up with some of the parts of the theory. Darwin was the first one to connect them together into a new theory that still holds water, 159 years later. This book should be in every science class and every school library, too.